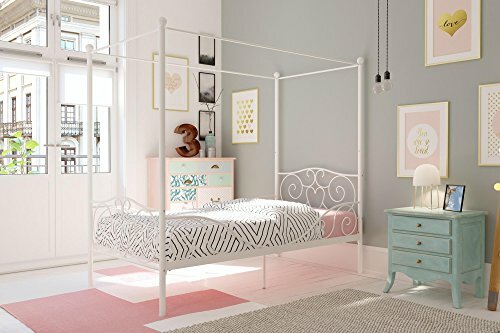 Make bedtime more enticing with the DHP Canopy Metal Bed in Pink. The embellished heart scroll design on both the headboard and footboard evoke an elegant, yet fun look to your princess’s room. The four canopy posts, topped with gracious finials add the finishing touches to this delicate piece. Highlight its beauty even more by placing sheer curtains over the posts. The layered effect creates a special place for your little girl to play and sleep. Designed to fit a standard twin mattress, this bed includes metal slats that eliminate the need of a box spring.